I provide small garden designs for homeowners, container gardens installs for homes and businesses, and offer garden talks and classes at various locations on horticulture topics, and sometimes sell plants, garden art, and container gardens at farmer’s markets. It’s a job I love to do and feel very lucky to enjoy, especially this time of year when May arrives. So, I thought why not share a questionnaire I completed for a Career Day at a middle school. I attended the event along with other small business people to share what and how we do our jobs. 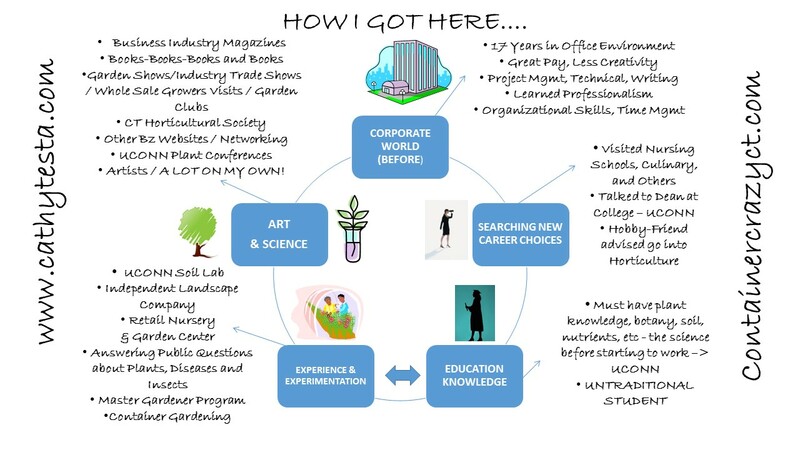 If you are a tween or young student considering the world of horticulture as a future career – this may be of interest to you, or if you are a teacher wanting additional information about this career choice for your students, here it is. Feel free to ask for more details. How do you deal with difficult customers? – The rule stands! The Customer is Always Right. NO customer is difficult –they are presenting you with a challenge, make it fun and solve what it is they need; ask more questions to clarify; and also show them your knowledge and expertise, and they will learn to calm down if they are nervous or difficult when they see you have the experience and knowledge behind what you do. If you supervise/manage people, what additional skills do you need? — To be a leader, you must have excellent personality skills and organizational skills, sometimes people are born with these traits, and some styles cannot be learned. To motivate your staff is key and the key is to also know what drives them — and each person has different ways they want to be rewarded. It could be pay, praise, or other things like that. What makes a place a great place to work? – When you feel valued as an employee, are listened to, can contribute your knowledge and skills, – and anytime you do something that is like a HOBBY for a job – you will feel like every day is “not work”, but fun! I love what I do, it is not work most times because I enjoy it so much. Think about something you do today as a hobby, and think if it could be a career. What can happen should you make a mistake? — Easy, correct it immediately as soon as you know, apologize, learn from it and move forward. What happens if you don’t work the hours you are expected to work? — You get fired or let go. You can’t treat a job like it is a game.., it is your responsibility to follow whatever guidelines a business establishes for their employees. Basically failing to show equals failure. Never forget, there is always someone else in line that can do the job you are taking advantage of – so if you don’t show up – someone else will. If you like your job, respect the rules. What education/job training do you need for your position? –– See my handout – definitely horticulture, botany, knowing the plants are a must in the field of horticulture. And learning or having a natural artistic ability is very important for design – it is a science plus an art. I knew I had to learn the plants, how they grow, nutrients, soil, and the plants themselves – you cannot talk about plants if you don’t know their botanical facts and features. What skills do you need for your job? — Organizational skills, the hort world is fast paced, short season, in winter it is inactive or at rest, so you must be on-top of your game during the busy seasons, or you lose out on making money in the seasonal time frame. Business and financial management is also key if you want to start your own business. And personal/interpersonal skills, plants are usually planted “by people” and thus you have to deal with people. Introverts are not usually good designers for landscapes, you need to be able to talk with and understand your customers and clients. You also need to use technology, applications, and take the time to read new materials or reference information about plants, marketing of plants, and any new news on things out there – say an invasive bug is out there on trees, you have to know to help solve clients problems with their plants as part of the job. 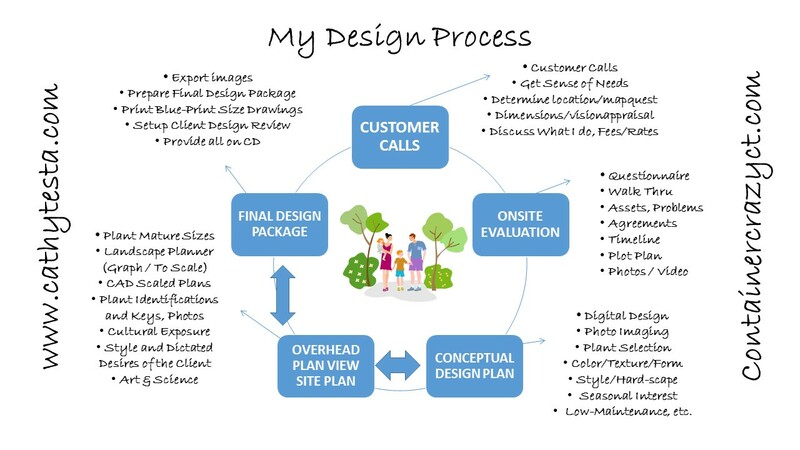 You need to know how to answer questions – because when designing, it isn’t just about the design, it includes the health of the plants, how they grow, etc. Knowing how to do taxes and setting up your business legally is another skill you have to learn. How are you measured on your productivity? — I have my own business, so my productivity is based on results, how much I sell and also I tend to stay focused every day, and don’t let home distractions get in the way of my daily work for my business. How frequently do you go for additional training? – Probably every quarter – taking classes via things like Uconn conferences every winter, reading A LOT on my own via design books and plant references, reading a lot of blogs and college resource/reference databases on plants. There are so many plants out there – you could learn one every single day and still not know them all by the time you die! Seriously, it is almost like being a doctor having to know about all the diseases out there – the list is endless. I took a 2-year Horticulture degree first, then gained good experience at nurseries, then went off on my own to do designs, then took the MASTER GARDENER program and I attend a lot of sessions at The CT Horticultural Society (FREE TO STUDENTS, CHECK IT OUT: WWW.CTHORT.ORG) and through other hort organizations and go to lots of big garden shows. What skills do you use in your job that would surprise people? – This is a tough one to answer, I guess for me, surprising is that I had to learn how to hitch a big trailer to my big truck and how to unload materials from it and as a woman, some of my friends are surprised when they see me show up using equipment or power tools – this field of horticulture is expanding in the woman world, lots of women run big equipment for install jobs now, where years ago, it was mostly men contractors out there. So if you are female, do not let that stop you! It is an equal opportunity hort world! What am I learning now that will be helpful for me in this career field? –– Technology. There are so many new gadgets coming out – all the apps now for iPhones really help to quickly reference information about plants, bugs on plants, diseases on plants, and tools like the color wheel app that may be used to select beautiful color combinations for your garden designs, I believe you – the younger generation of students – will be the ones teaching us older hort people because you are faster at learning the technology than we are! Landscape programs are really useful too. I just loaded the Square Up program in seconds the other night to accept credit cards when I sell plants at farmers markets for example, the technology moves at warp speeds, keeping up with it is the latest new thing I’m learning. What can happen should you make a mistake? — Harmful plants such as invasive can be a big problem if planted in someone’s yard, you have to know if a plant can creep and literally take over the whole landscape – that could be a big issue. Also, Call Before You Dig, warning clients of proper procedures before they plant is critical. 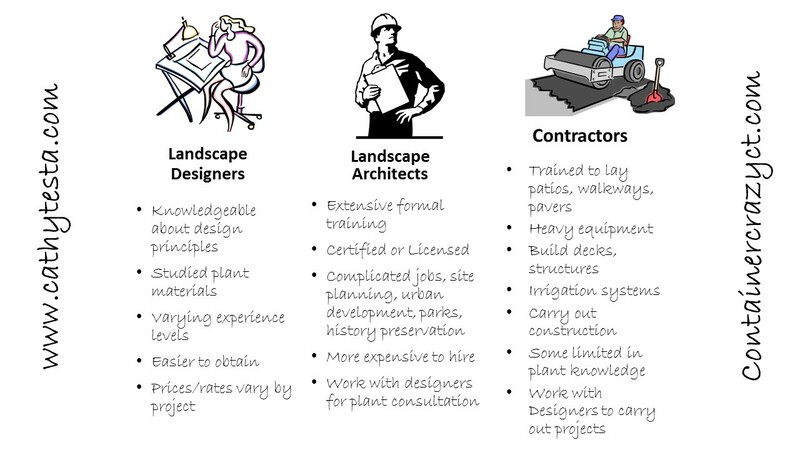 Knowing your limitations and expertise, knowing how to direct clients to specialists in certain aspects of landscaping, such as hardscapes, paver, building materials, for example. If you make a mistake, someone can get hurt so do your research first and advise appropriate to your clients. Design does have risks, especially if there are building materials, ground problems in the area, water runoff to rivers is critical, you have to know if you could pollute a water source with fertilizers or underground pipes, stuff like that. Do you have any security/safety measures in place? — I don’t handle installations so my risk is limited. If I had a crew, I would get the appropriate insurance and licensing. It is critical to protect yourself in the event someone gets hurt on the job, etc. Don’t forget to check out Cathy T’s Container Gardening Class on May 24, 2014 in Broad Brook, CT. See also Cathy T’s Garden Talks. Please share or join this blog by entering your email on the sidebar, you will get updates via email and special offers or coupons of upcoming classes as a Cathy T blog follower! ← Happy Easter Everyone – Hope It’s Hopping!